Wool shopping and a bit of swatching. I have just bought some gorgeous Rowan wools to make crochet swatches. 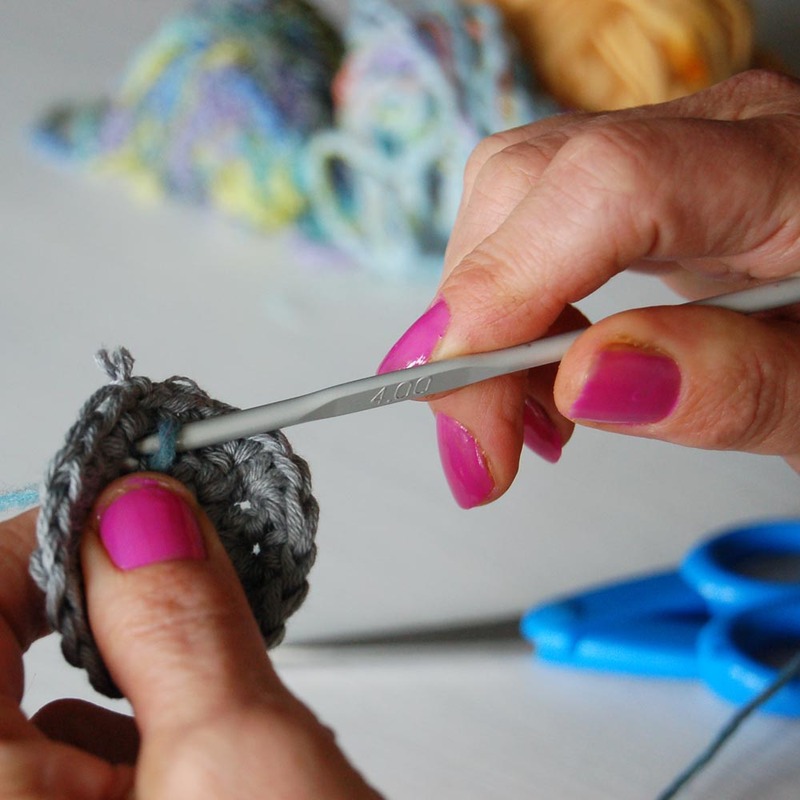 I have lots of ideas in mind using different crochet stitches and am on a mission to match the designs to beautiful yarn that can be made up into the designs. I love the colours available in the Baby Merino Silk, and the Purelife Revive. Unfortunatly the shop I went to did not have the Soft Knit Cotton which has all of my favorite colours in the range. This little lot should keep me busy for a few days, I can’t wait to get swatching. 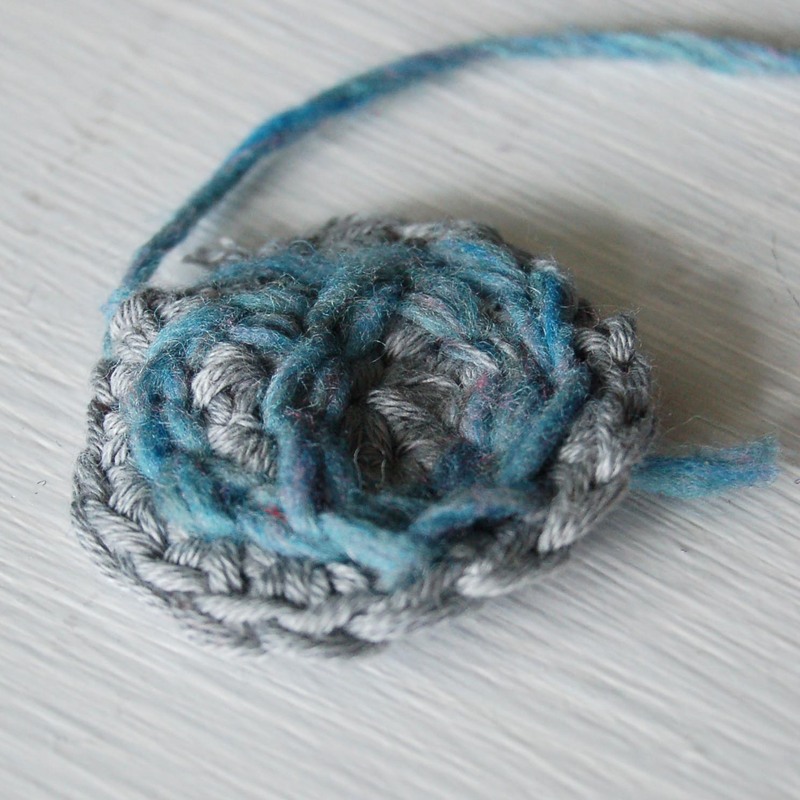 Funky Scrumbled Crochet Brooch Tutorial. I have been making these little brooches for a few years and have been asked so many times how I make them that I thought I would show you how. 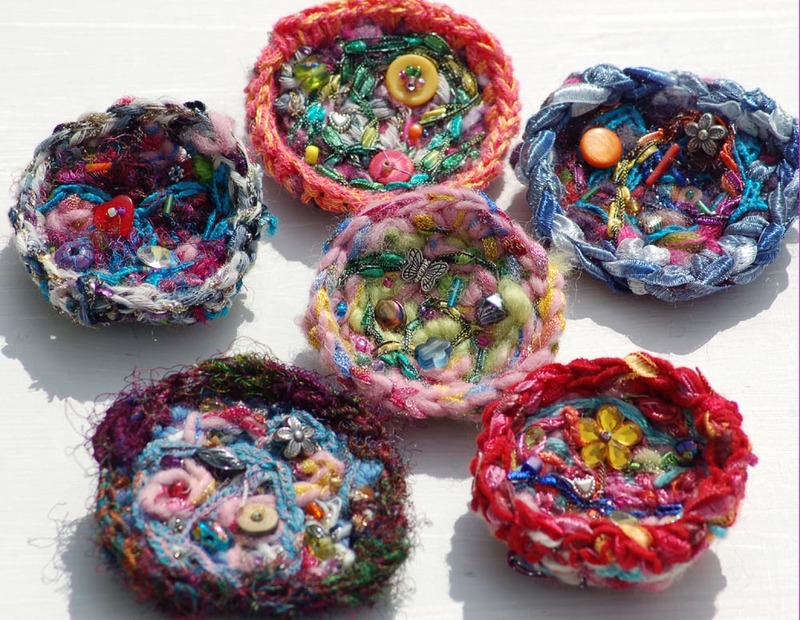 They start as a basic circle, then using surface crochet and lots of different yarns they build up into colourful textured mini works of art. Ready to embellish with beads and buttons. I love things that whip up quickly and these are perfect for in between other projects when you just want to start something and finish it in one go. 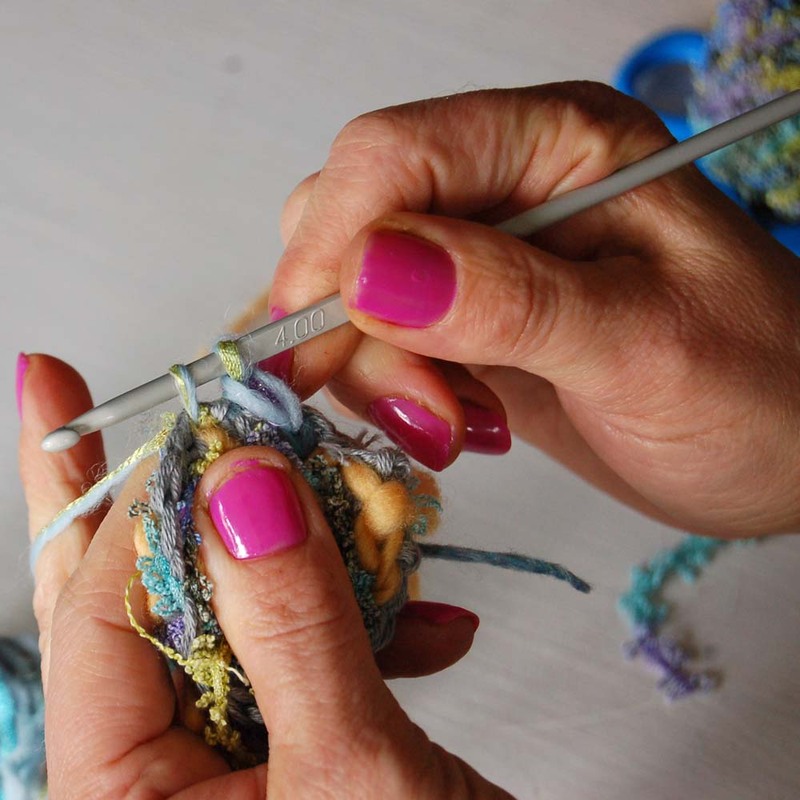 It is also great for using up little scraps of yarn. 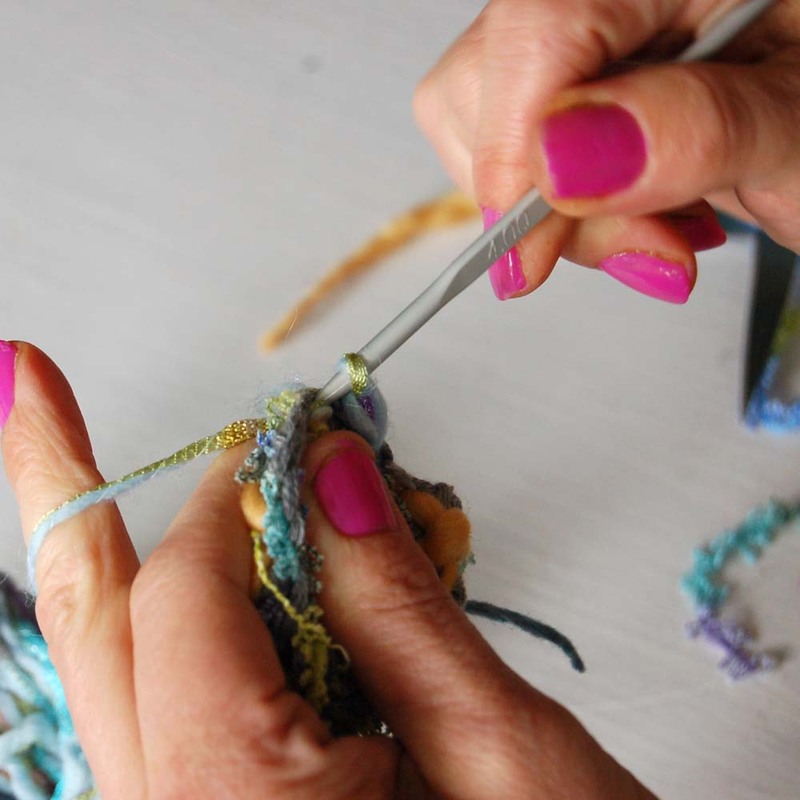 Strips of fabric can also be crocheted in. 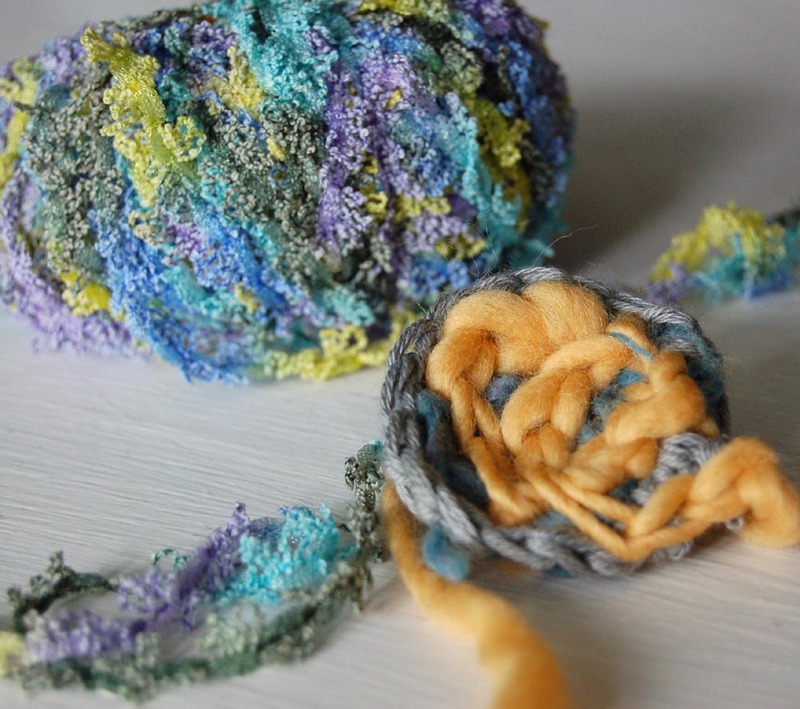 Assorted yarns for scrumbling . 1st round : ch 4,join with a ss into first ch. 2nd round: ch 2 (acts as first dc) 7 more dc into ring. ss to first st.
you can make the circle bigger by following this method ie next round 2ch, 2dc into first sp, 1 dc into next 4 sp etc. 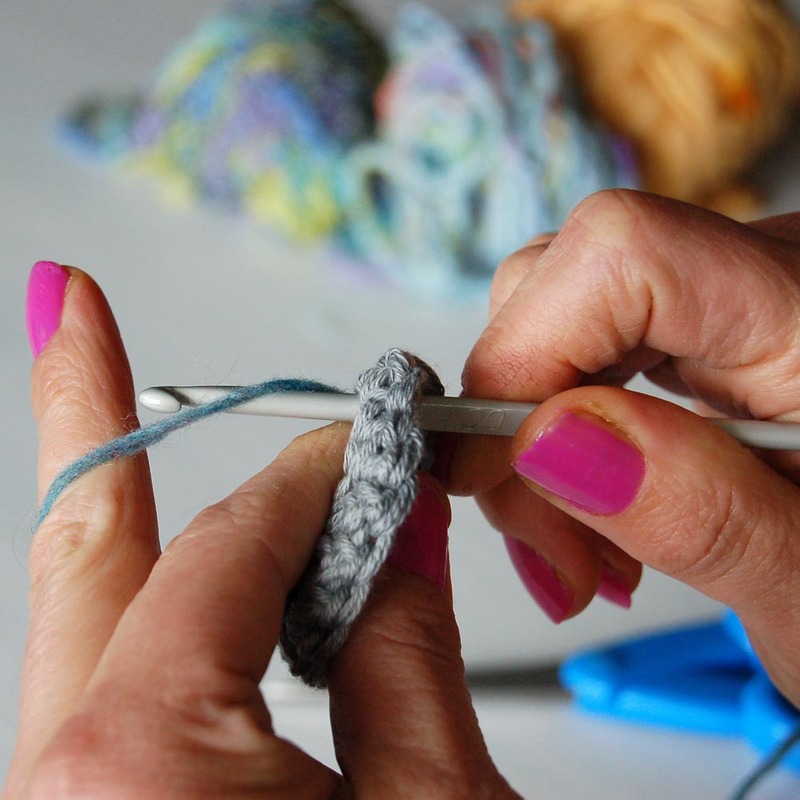 Take the first yarn you are going to use and the appropriate size hook, I am using a size 4mm with Dk yarn. 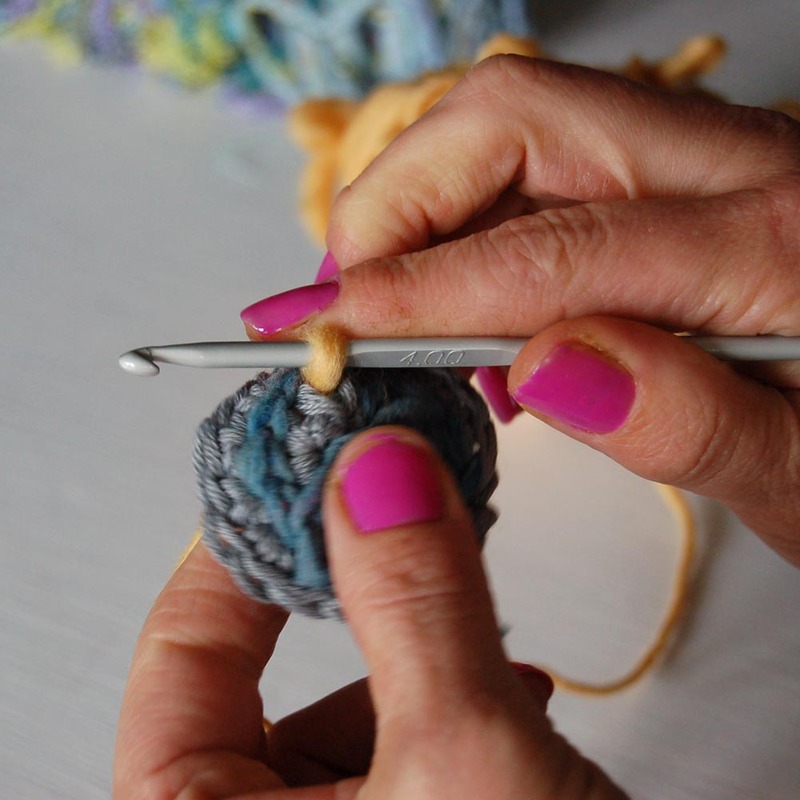 Go through the ccircle and wrap the yarn around the hook, bring the hook back up through the circle. 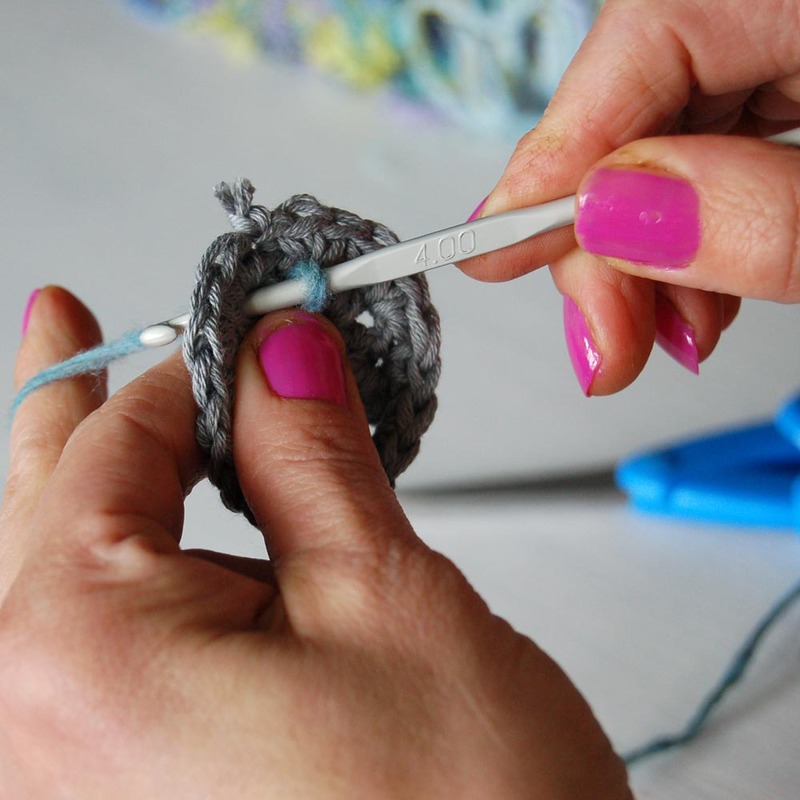 Put the hook back through another space/stitch wrap yarn around and bring back through circle (making a stitch) . Pull stitch through stitch already on hook leaving 1 stitch on the hook. 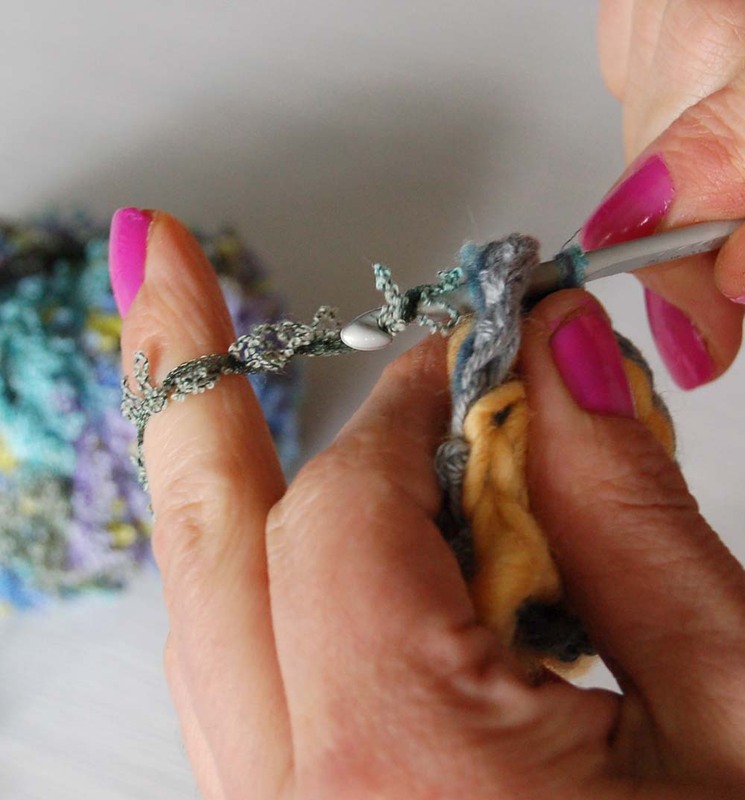 Repeat all over the circle making a chain stitch on the surface of the circle. 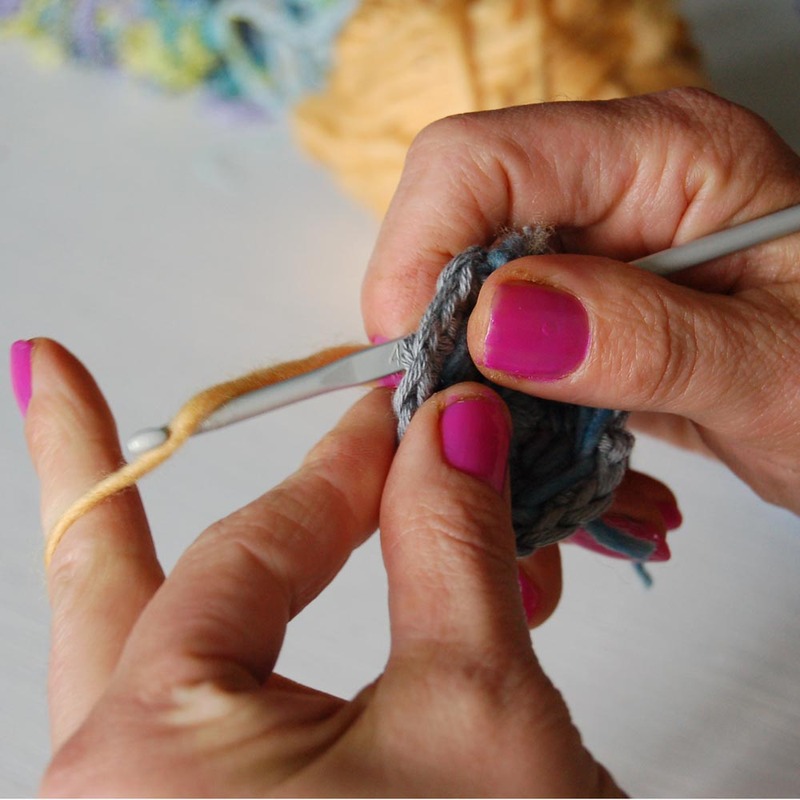 When it looks like the picture below cut off the yarn and pull through the stitch securing the end. Pick your next yarn, I have a contrasting colour and repeat as above. With this thick wool I could have gone up a hook size but I am such a loose crocheter that it was fine with the hook I was using for the previous yarn. There are no rules to this it is all about being creative and experimenting. 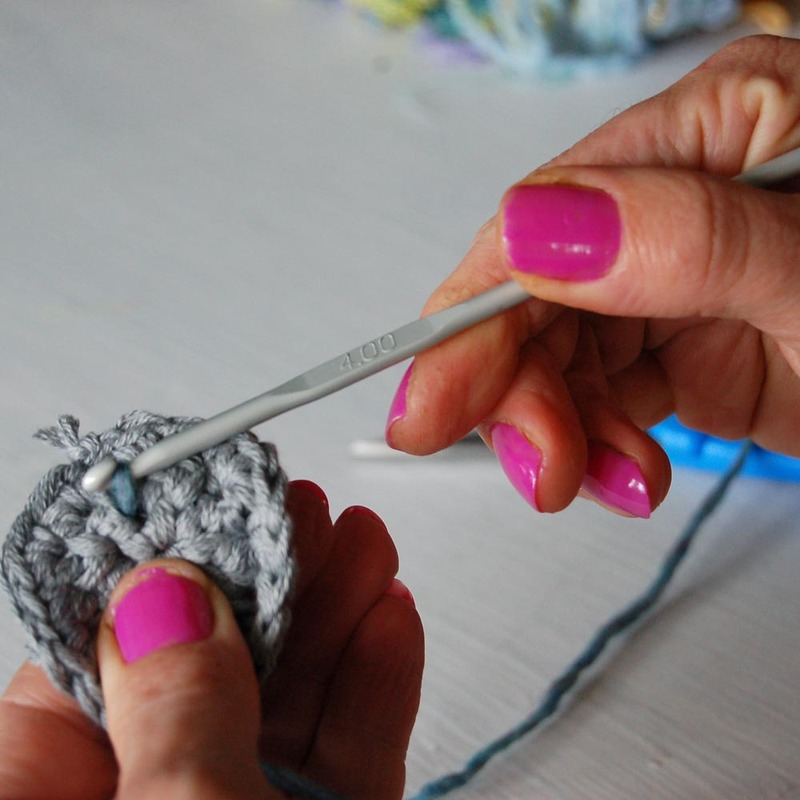 you can crochet over the top of the previous yarn in a random pattern. 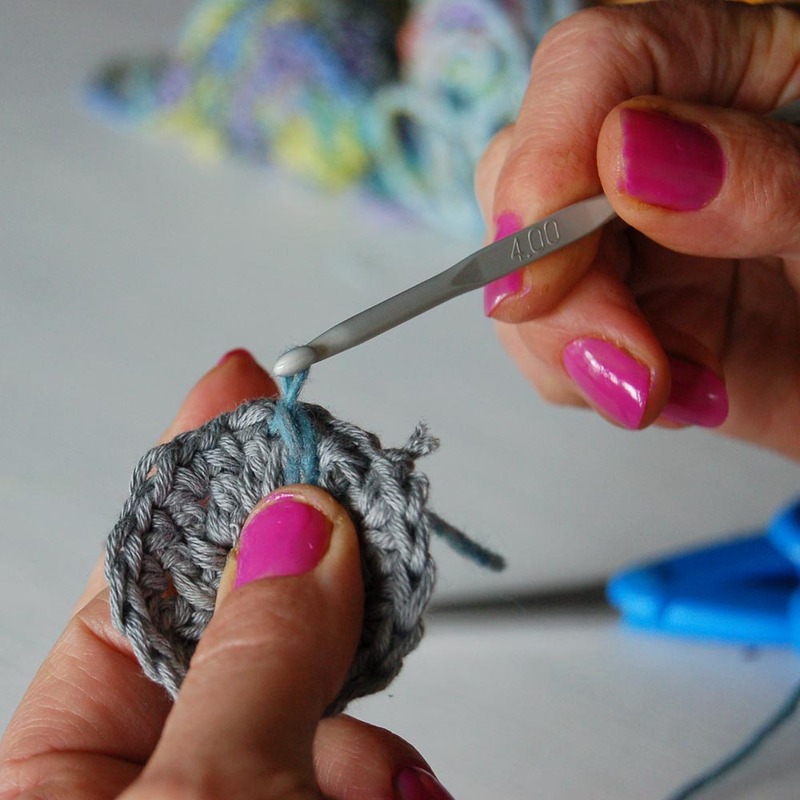 When you have finished cut off your yarn and pull it through the last stitch to secure it. Pick up your next colour and repeat as above. The last yarn I used to go over the circle has a bit of sparkle to it. ( I can’t remember the name of it but will edit this when it comes back to me) This shows the back of the brooch. Next is the edging, using a wool with a bit of sparkle or texture, single crochet around the edge. (hook through space, yarn over, pull back through (2 stitches on hook) yarn over pull through 2 stitches) Repeat this around the edge. This gives it a nice finish and brings it back into shape. 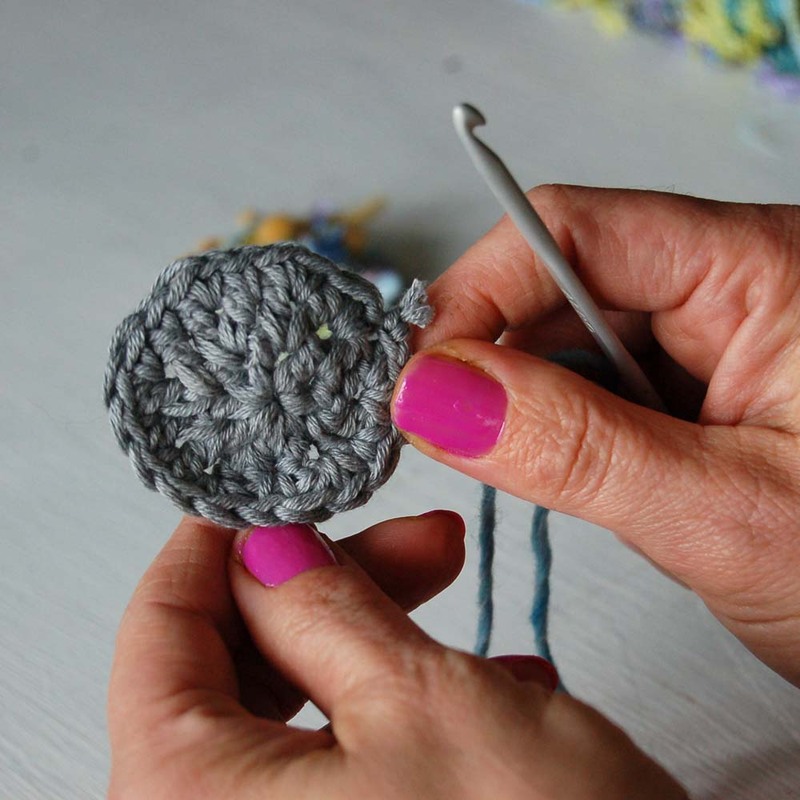 While doing the scrumbling your circle can lose its shape slightly, this is normal and due to the different textures of yarn. 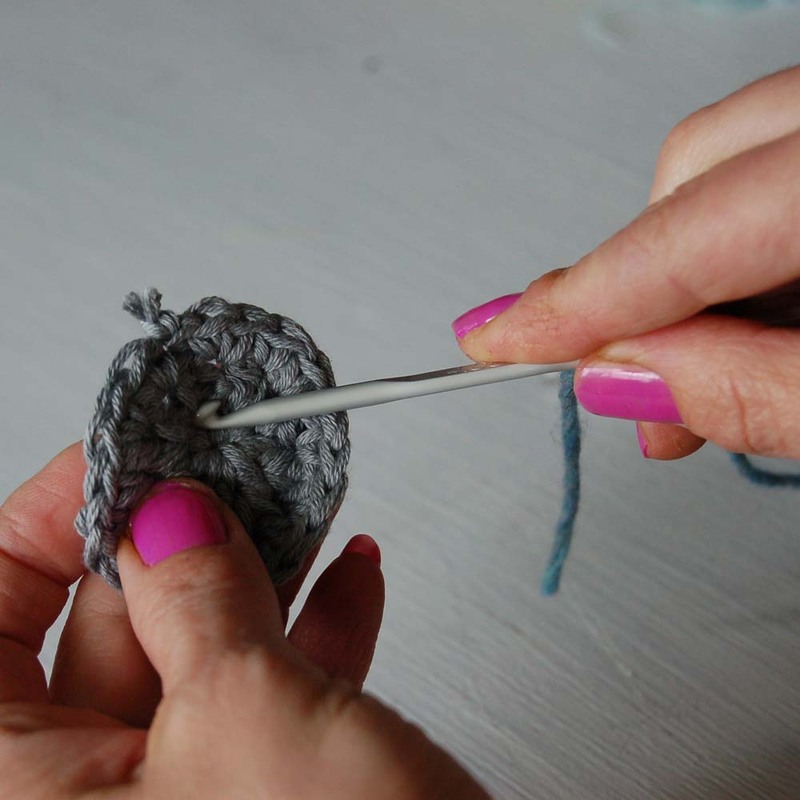 I sometimes remedy this by crocheting it back into shape if it is to distorted. 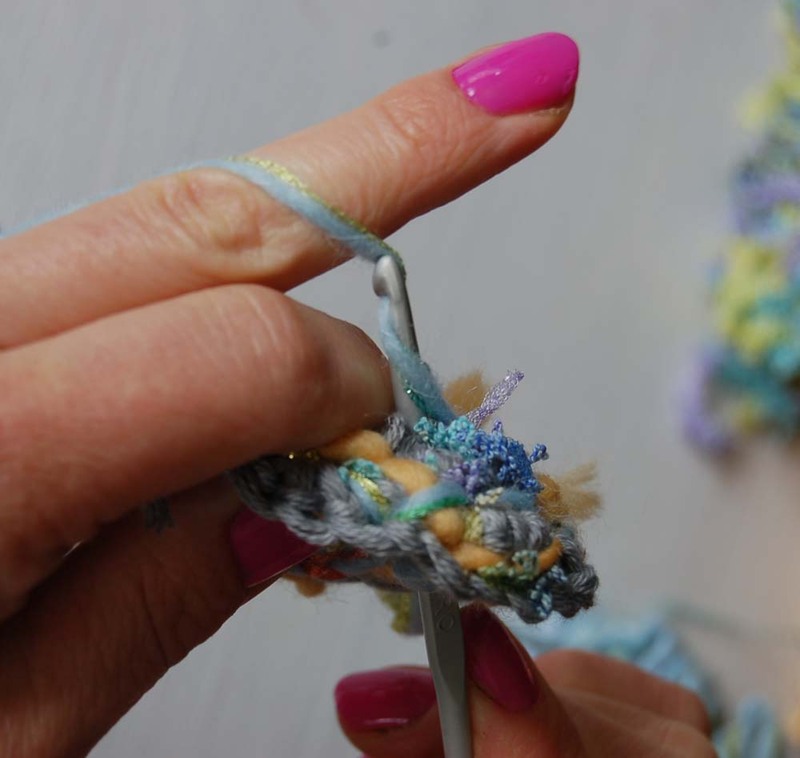 Next sew in all the ends neatly at the back of your brooch then embellish with beads and buttons of your choice by stitching them on with needle and thread. If you have any queries or I have made any mistakes do let me know by leaving a comment. 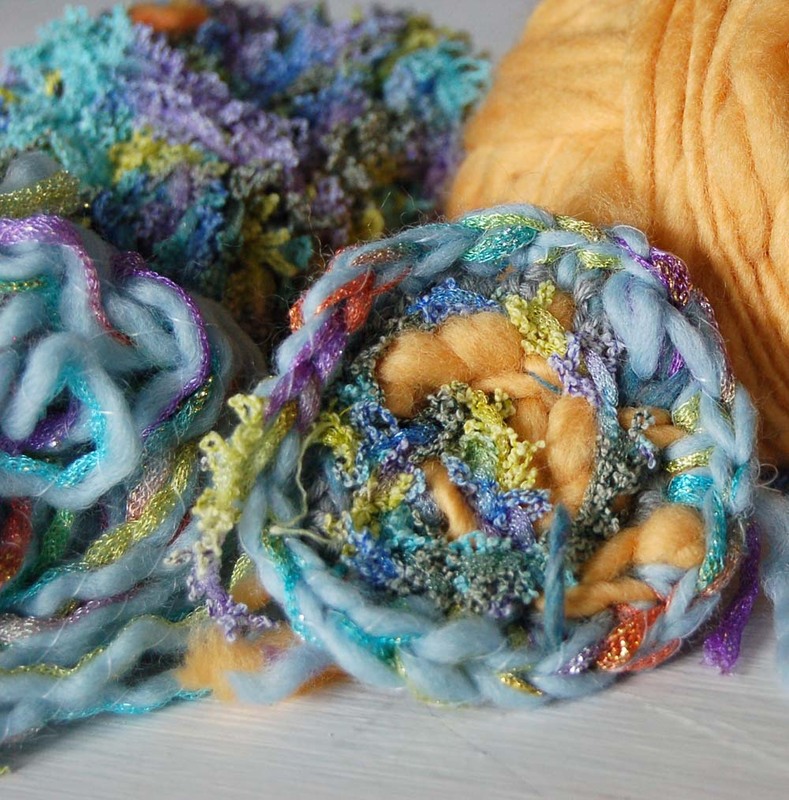 I have found some of the Gedifra yarns on sale here at Knits in The City Sari silk and ribbon yarns are also good for this kind of surface pattern.